Faculty of Engineering offers world-class standard education and provides its students modern facilities, rich cultural environment and a variety of study programmes to choose from, covering such study fields as information technology, computer engineering, electronics, telecommunications, computer management and computer science, mechanics and metal working, heat power industry, heat engineering and mechanical engineering, architecture and construction, production and processing. The main objective of the programme is to deliver IT knowledge and specific skills needed for effective information systems management in a fast changing world. This field of study focuses on theoretical principles of computer science, algorithmic, computer programming, database systems and operating systems. Mechatronics is a field of engineering based on machines, electronics, and hardware and control systems technologies. Mechatronic engineers use their notions of machinery, electronics, hardware and control to see and improve the system as a whole and deal with all aspects of these mechatronic systems regarding design, operation, maintenance, repair and renewal. The programme developing the competencies to analysis, design and build sophisticated business information systems and use state-of-the-art methodologies, tools, hardware and software. The programme provides the opportunity to integrate classroom learning and real business projects. Completing of the programme will enable you to apply theoretical knowledge and practical skills in the industry and scientific research, successfully realize yourself in the field of optics, physics, modern material handling, welding, measuring technology and communications. 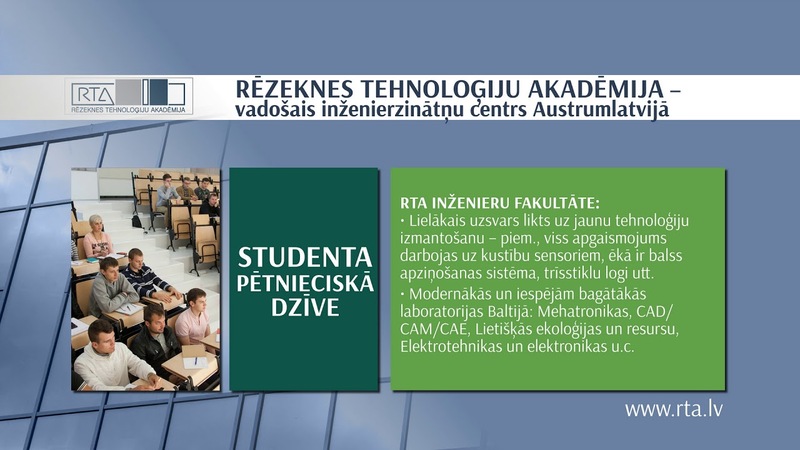 The goal of the programme is to prepare researchers in the field of information technology industry systems analysis, modelling and design sector, to promote the students’ theoretical knowledge and research skills. Deeply specialized professional studies and research promote students competencies in field of environment science. Graduates are able to work in research institutions, to do the environment research work in the field of environmental engineering, to work in environmental protection institutions, local government units, industrial companies, to carry out academic work in universities, work of environmental quality assessment and research laboratories, evaluate natural resources, mining and processing, work with environmental equipment, technology and design development organizations. International scientific practical conference "Environment. Technology. Resources. ".